I have been knitting as long as I can remember. The rhythm, the feel of the yarn through my fingers, the challenge of the craft, the communion with past and present knitters, each forges connection with the earth and the divine. It is my spiritual practice. In November 2014, recently retired and facing a cold dark winter with little color and even less heat, I needed a challenge. A challenge where I could accomplish something tangible every day. A fun challenge that would keep me from watching too much football and too many old movies. A challenge that would fit the season. Hats! Hats are fun and quick to knit. 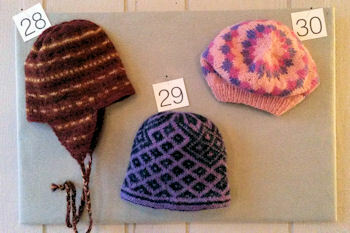 I would knit thirty hats in thirty days! * Starting on November 15, 2014, knit a total of 30 hats through December 14, 2014. 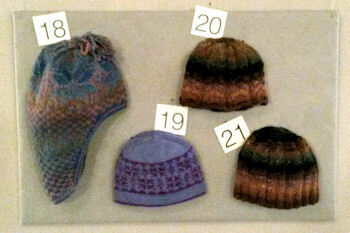 I don’t need to knit a hat every day but I do need to knit 30 hats in 30 days. * The hat can be any size. * It must be my own design but I can use designs that I’ve knitted before. * Use yarn that I already own. * Write down the pattern. * Post a picture of the completed hat on the blog, Facebook, twitter and Instagram. Thirty days later I had thirty hats. All different and all my own original designs. 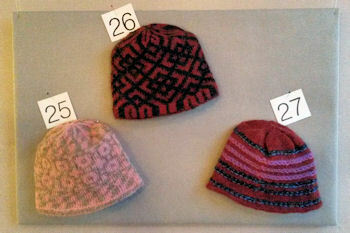 Most of them are knit with Blackberry Ridge wool or Schoolhouse Press un-spun Icelandic wool. I prefer to knit with wool for its natural earthy properties. In designing, I drew on favorite motifs from folk traditions or let the yarn dictate the texture. I was surprised that not only did the designs keep coming but each design beget more designs and ideas were growing exponentially by the end of the project. When not working on the book, or knitting, I’m busy blogging about knitting. My current focus is “stash reduction” where I comment on organizing the yarn stash, quick stash reduction projects and tips for avoiding the pitfalls of yarn acquisition. I’m in the planning stages for more knitting/fiber related tours and retreats through my company Wool Forward and am beginning to self-publish my own designs. You can learn more about the tours, my knitting and my designs by following my blog https://woolforward.files.wordpress.com and following Wool Forward on facebook, instagram and twitter.